Hortus Camdenensis | Gladiolus italicus Mill. Frost-hardy cormous perennial with narrowly funnel-shaped, purplish-pink to magenta flowers with paler marks on the lips in early summer. To 60cm. [RHSE, Hortus]. ‘The present species and Gladiolus communis (No.86 of this work) have been usually reckoned varieties of each other, at least by the more modern botanists; but, as we think, without reason; for the differences are several and material, the proofs of the one having contributed in any way to the production of the other, none. Our plant has a smaller bulb-tuber, slenderer leaves; the larger or upper segment of its corolla removed from between and suspended over its lateral one, not enclosed by them as in communis; the upper lateral segments are about equal to or even narrower than the three lower ones, while in that they are far broader; the three lower ones are equal among themselves, or the middle may be a little narrower, but in communis this is twice the broadest; the anthers are also longer than their filaments in this, which is not the case there; and above all our species may be distinguished from the other by its round, solid, subbaccate seeds, having a thin lamina of reddish pulp between their coats, but which is not quite so thick as in Babiana, while in that they are dry, chaffy, and flat, edged with a broad membranous wing or border, formed of the tunic, which is much larger than its small cartilaginous nucleus, round which its vacant portion is pressed quite flat, nearly as in the Cape species. 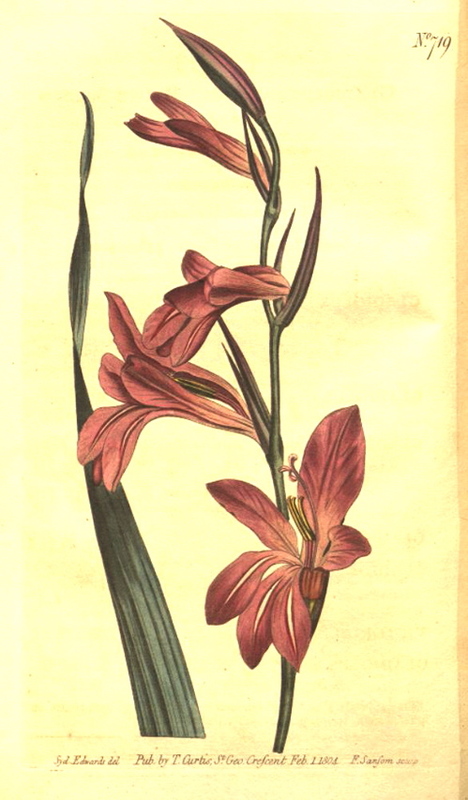 Whenever we have spoken of Gladiolus communis, this was the plant we had in view but as the other has been already published, under that name, by Mr. Curtis, in this work, and since it is often impossible to determine which is meant by many Botanists, we have thought fit to let the original name remain with that, though our plant is doubtlessly included by Linnaus in his books as a variety; or indeed may be the one he intends in his description. A native of Dauphiny and most probably of other parts of South Europe. Desfontaines found it in Algiers. It grows among corn and in dry sunny exposures on low hills. In our collections it is not now nearly so common as the communis. We found it in the Botanic Garden of Mr. Salisbury, Brompton, where the drawing was taken; quite hardy, flowering about May or June, and propagates abundantly both by seed and offsets. We have no doubt but that there are other European species, that have merged as varieties of each other under one title, but which we shall endeavour to detect and distinguish in our numbers. The Banksian Herbarium contains a seeded specimen, which seems to be our plant, brought from Madeira, by Mr. Masson. According to Zanichelli (who gives an accurate description of the plant) our species grows in the Venetian territory, and varies much in the number of flowers; it is called Chiaggiulo by the inhabitants.’ [BM t.719/1804]. Listed in the 1845, 1850 and 1857 catalogues [B.165/1845]. Probably introduced by John Bidwill. [See Gladiolus cardinalis Curt. ].